#1. 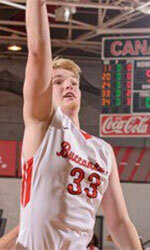 Evan McGaughey (6'8''-F-94, graduated '17, plays pro in Czech Republic). He could not help BK Pardubice (13-8) to beat BK Kolin (7-15) in the Czech Republic NBL. 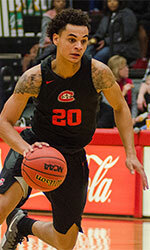 McGaughey recorded 9 points, 9 rebounds and 4 assists in 19 minutes. But BK Pardubice lost 78-84 at home to the lower-ranked (#10) BK Kolin. The Regular Season already ended. It's McGaughey's first season with the team. This year he averages 7.1ppg, 4.7rpg and 1.3apg in 21 games he played so far. #2. Godson Eneogwe (6'6''-G/F, graduated '16, plays in Spain) was not able to help Villarrobledo in their game against Girona Basquet (13-8) in the Spanish LEB Silver (third division). He scored 6 points and grabbed 5 rebounds. The third-placed Villarrobledo (13-7) was defeated 70-58 on the road by the lower-ranked Girona Basquet (#4) in the East group. There are only two games left until the end of the Regular Season. So now every game will be critical. This season Eneogwe averages 4.0ppg and 3.5rpg. #3. Courtney Belger (6'2''-G-89, graduated '12, currently in Germany), who plays in the German ProA (second division) was not able to secure a victory for Schalke (7-13) in their last game. Despite Belger's very good performance Schalke lost 76-88 in Allmendingen to the much higher-ranked (#5) Ehingen/Urspringschule. He was the second best scorer with 15 points. Belger also added 4 assists (went 9 for 9 at the free throw line !!!) in 32 minutes. It was Schalke's fourth consecutive loss in a row. Belger has individually a very good year with high stats. He averages 16.0ppg, 4.7rpg, 4.7apg and 1.2spg in 19 games. #4. Herm Senor II (5'11''-PG, graduated '17, plays pro in United Kingdom) was the major contributor in a Solent Kestrels' victory against the league outsider Manchester Magic (1-15) crushing them 97-69 in the British NBL D1 (second division) last Saturday. He scored 21 points, grabbed 4 boards, passed 9 assists and added 3 steals; quite an impressive performance considering it's only Senor II's second season in pro basketball. Solent Kestrels (13-2) is placed first in the NBL D1. This season Senor II has very high stats. He averages 19.9ppg, 4.8rpg, 6.5apg and 2.9spg.